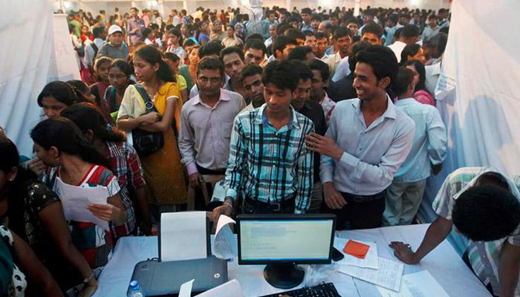 New Delhi, Nov 22, 2018 : Percentage of employable population in the country grew to a new high of 47 per cent this year, an increase of almost 2-3 percentage points since last year, with engineers being the most employable class, a report said Thursday, Zeenews reported. The employability rose by 14 percentage points in the last five years, from 33 per cent in 2014, according to India Skills Report, a joint initiative of Wheebox, PeopleStrong and the Confederation of Indian Industry (CII). The employability amongst masters of business administration (MBA) graduates, however, has dropped by three percentage points over last year, the report said, without specifying the exact number. "It seems that with exponential increase in the number of MBA colleges, the quality of talent is seen to be declining," it added. The report also found that there has been a drop in employability of bachelor of pharmacy (BPharma) graduates. Among the states, Andhra Pradesh topped the list with highest employability, followed by Rajasthan and Haryana, which have made their entry into the top 10 ranking for the first time. Madhya Pradesh, Gujarat and Punjab moved out from the top 10 list this year. There has been an increasing presence of employable talent in tier-II and III cities, according to the report. "This trend can be seen in spite of lack of big institutions such as IITs and IIMs or any other renowned institutes in tier II and III cities," it added. Wheebox founder and chief executive officer Nirmal Singh said the employability touching 47 per cent is good sign for the market. "But we have a long way to go and entire ecosystem should focus on bridging the employability gaps, enhancing the talent pool, thus taking measures from school level to professional level focusing on learning," he added. The report took into account 5,200 universities and professional institutions in the country, with over three lakh students across 29 states and seven Union territories.